Mariupol concludes the list of 32 with police patrol departments. In Mariupol, Donetsk region, 172 officers, including 38 women, were sworn in a ceremony held at Teatralna Sq. on 30 May. The event was attended by Interior Minister Arsen Avakov, the head of National Police Khatia Dekanoidze and Prime Minister Volodymyr Groysman. The Mariupol police patrol will have 24 patrol cars at its disposal. The chief of Mariupol patrol police will be Vitaliy Horkun, who, according to the 0629 website, has previously served in aviation, is an ATO veteran, and then worked in Boryspil International Airport. 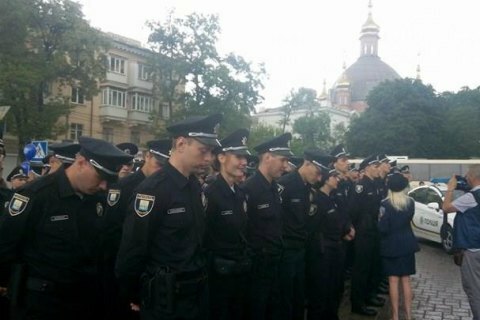 People's Deputy Mustafa Nayyem, who took part in the launch of national patrol police, wrote in Facebook that the ceremony of swearing in Mariupol was the final as 28 patrol police departments have been created in 32 cities across Ukraine with overall number of patrol officers almost at 13 thousand. Mariupol wraps up the list of 31 cities of Ukraine with patrol police departments: Kyiv, Lviv, Odesa, Kharkiv, Uzhhorod, Mukachevo, Mykolayiv, Lutsk, Khmelnytsky, Dnipropetrovsk, Ivano-Frankivsk, Kherson, Chernihiv, Vinnytsia, Kremenchuh, Cherkassy, Poltava, Ternopil, Zhytomyr, Boryspil, Chernivtsi, Zaporizhzhya, Rivne, Kirovohrad, Sumy, Slavyansk, Kramatorsk, Kryvyy Rih, Lysychansk, Rubizhne and Severodonetsk.